This piece was first published by the Vancouver Sun on August 7, 2018. What’s worse than a discriminatory Project Labour Agreement (PLA) paying off political favours and forcing unionization on the 85 per cent of construction workers who have chosen to organize themselves differently than the NDP and old-school Building Trades unions want? How about a sloppily written PLA that contains various errors and claims to attract new workers to the trades by paying them LESS than minimum wage? 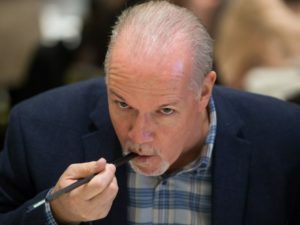 The NDP and Building Trades, who for years have positioned themselves as the champions of the working poor, have agreed to pay various pre-apprentices less than the $12.65/hour B.C. minimum wage. And not just one specific trade. The NDP and their long-time political supporters in the Building Trades have negotiated in the backroom a deal that will pay bricklayer pre-apprentices $11/hour, drywall tapers and finishers $11.78/hour, glaziers $11/hour, painters $11.19/hour, tilesetters $11/hour, and terrazzo workers $11/hour. Why would young people consider a career in the trades when they can make more working at any other job they can find? Does that sound like a commitment to attracting the next generation, as Horgan and his Building Trades donors constantly stress? These are high-demand positions. An ICBA survey earlier this year showed every single one of our glass companies wants to hire more glaziers, and are paying up to get them. To make matters worse, pre-apprentices could be stuck in their positions for years, as there is a lack of seats in trade schools around the province. The millions of dollars being handed over to the Building Trades unions through a variety of per-hour fees would be better spent in opening up more training seats. Transportation Minister Claire Trevena says the union-only model will drive up the cost of the Pattullo project by $100 million (we believe this is grossly underestimated, but let’s take the Minister at her word). Investing that $100 million in high school programs to encourage young people to learn a trade and in technical schools to train more graduates would bring a whole lot more people into the trades than handing over millions of dollars to union bosses. But that wouldn’t repay $2.3 million worth of political favours – the amount given to the NDP by these Building Trades unions since 2005. Despite 336 pages – including dozens outlining the excruciating minutiae of work camp life and menus – this PLA is poorly written and it’s clear that the NDP rushed it. In what is likely a four-page-long series of typos (pages 163-166), affecting eight different classifications of Teamsters, the wages listed in this agreement drop by as much as $19 per hour in 2020 and beyond. For example, a Group 1 Teamster drops from $31.40 per hour in 2019 to $12.13 per hour in 2020, according to the table in the deal. Obviously that’s not going to be the case, but it shows how rushed this PLA was. Who knows what other errors and surprises lurk beneath the surface of this agreement? And what the NDP/Building Trades will change on the fly to fix it? While much ink has been spilled on all the perks planned for work camps, trades workers may want to examine what those unionized culinary workers will be paid to be there. Janitors will start at $26.17/hour. Bakers at $34.27/hour. The dishwasher at $26.17/hour. Plus they all collect another $6.77/hour in benefits. Bakers will out-earn fully-ticketed glaziers, roadbuilding operating engineers, and mechanics. Dishwashers will make more than two-term millwright apprentices and six-term painter apprentices. An entry-level piledriver will make $4 per hour less than the entry-level janitor. Those bakers, dishwashers and janitors will get five weeks paid holidays. Drywallers, mechanics, operating engineers, and glaziers only get four. It all sounds crazy, but remember, in partnership with the Building Trades, the Government has taken away the right of workers to choose whether or not to join a union and which union to join. This puts an end to fair, open and transparent procurement. No matter how a construction company organizes its workforce, every company should have the right to bid and win government work. One year ago, John Horgan promised a new way of doing business in B.C. Sadly, it’s one where he has put the interests of his union donors ahead of what’s best for British Columbians, ahead of fairness, ahead of getting good value for tax dollars, and ahead of what individual workers want.